10 grammes of the finest Kids Mohair (23-25 microns) from Australia. 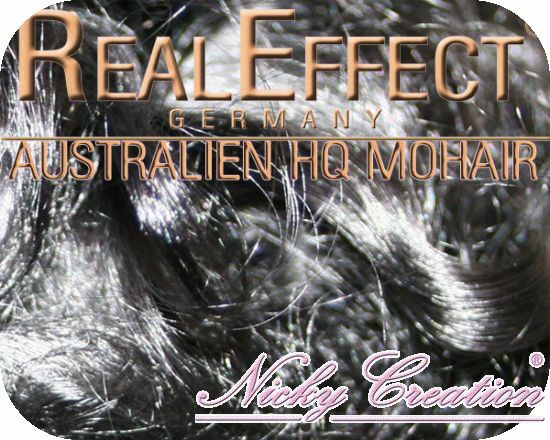 This mohair is from one of the last 3 flocks in Australia that hasnt succumb to inbreeding. That is why we can offer you this unbelievably high quality mohair. The mohair is hand treated and coloured by the farmer, air dried and it isnt brushed on the farm, as this would raise the price astronomically. The HQ Mohair is out of the 3rd - 5th shearings and is between 8-12cm in length. In the opinion of many of our customers, the shine and softness is hard to beat. Not only does it look good, but you will find that it is a lot easier to root with than cheaper versions. Advice: Remember to buy enough to root your whole babies head with, as there can be slight variations in the colour from one pack to another. Also it takes a long time for the hair to come to us (we have to wait for the goats!) Always keep a good supply at home!